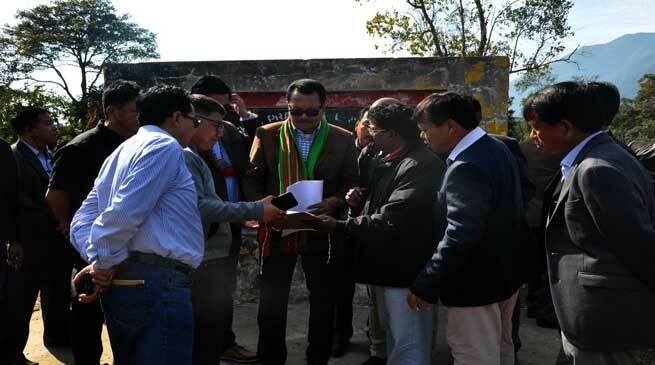 Deputy Chief Minister, Chowna Mein visited some State’s important project sites at Pasighat today. He was in Pasighat, District Headquarter of East Siang to attend the foundation laying ceremony of the Murkongselek-Pasighat new Broad Gauge (BG) Line and the commencement of Final Location Survey of new BG lines in the state by the Union Minister of Railways, Suresh Prabhakar Prabhu, which was earlier scheduled on January 23 but has to be postponed due to unavoidable circumstances. During his visit to the site of Arunachal Pradesh State University of Pasighat, DCM asked EE PWD to prepare Master Plan of the University immediately in consultation with the department of Higher & Technical Education and submit the over all estimate of the University Building to the Govt. He lamented over the inordinate delay in the preparation of the Master Plan, which should have been done first instead of asking for allocation of fund in fishmeal basis. He said that with this pace, the Arunachal Pradesh State University of Pasighat will take several years to come into reality. From the spot, he called a meeting of the Chief Engineers of the Executing Agency on his return to the state capital tomorrow to discuss the matters regarding the Master Plan and construction of the University Building. It was informed that the Govt has sanctioned an amount of Rs 5 Crore for Site Development and Construction of Adminstrative Block (Ground Floor) of the University till date. The University has an allotted land of 99 acres adjacent to the JNC Pasighat. He also visited the construction site of the Shastri Hostel of the Jawaharlal Nehru College, Pasighat to see the ongoing re-construction work of the hostel buildings that has just begun few days ago. Mein who himself graduated from the Institute and spent his college days in one of the hostel felt remorse to see the dilapidated conditions of the hostel buildings of the Premier Institute of the State. He asked the Executive Engineer (PWD) Pasighat to prepare a Comprehensive Plan for repair and maintenance of all the hostel buildings and asked them to submit the proposal immediately. Mein also inspected the under construction work of Outdoor Stadium at Pasighat and expressed satisfaction over the progress of the work. He observed that the stadium was not built in an ideal place because of its adjacent to the Advanced Landing Ground and comparatively of a lesser area. However, as much has already been done and it cannot be undone, he asked the department to expedite the works and complete the stadium in time. It was informed that 32.5% of the construction works has been completed and with the current pace, the department is planning to complete it by October 2017, ahead of the target schedule of January 2019. The stadium which will have a seating capacity for 12,000 spectators has a total site area of 48,383 sqm with ground area of 17,050 sqm and an open area of 23,043 sqm out site the stadium. It will have facilities for all kinds of outdoor games including football. Stadium will have seats under canopy for 3000 persons and sofa seating for 250 persons. It will have facilities like VIP Lounge, Recreational Hall, Gymnasium, Conference Room, Media rooms, Administrative office, Reception and lobby, medical room, counseling room, service room, cafeteria, kitchen and dining apart from a dormitory for 128 players with toilets. It will also have a parking area of 200 cars. DCM also visited the Advanced Landing Ground at Pasighat and interacts with the Officials present there. Flight Commandant informed the visiting dignitaries that the Landing Ground was built for defense purpose with military specifications. However, he stated that high trees adjacent to the ALG and along the funnel/approach path should be cleared to make way for the civil flight to land. DCM asked the Deputy Commissioner to look into the matter and take necessary steps as per the specifications for making it a dual purpose landing ground. Dy CM was accompanied by Tapir Gao, State BJP President, Dr Mohesh Chai, Minister of Animal Husbandry & Vatenary and Art & Culture, Tatung Jamoh, Parliamentary Secretary (Agriculture), Kaling Moyong, MLA Pasighat, Kento Rina, MLA Nari Koyu, Kaling Doruk, Chief Councillor, PMC, Tamiyo Tatak, DC Pasighat, Pranav Tayal, SP, Tameng Jamoh, EE (PWD) and Aken Jongkey, EE(Highways) among others during his visits.